I'm often asked why I chose harp. Ultimately, it's because I was too lazy to practice enough to be impressive on the other instruments that I played (violin and piano). I say this honestly because people don't realize how easy the harp is, and that doubt holds them back from ever trying it out. It takes only a few seconds to learn how to set up the strings to make that fabulous, classic harp sound that everyone recognizes. Once you can do that, everyone thinks you're amazing, and it doesn't matter what else you can or can't play. I've been playing harp now for more than 20 years, but it doesn't take 20 years to be good. I began playing harp in 1993. I was trained on pedal harp for two years by Faye Seeman➚ and another two years by Julie Buzzelli➚. After college, I figured that a pedal harp was out of my reach, and I went harp-less for as long as I had been playing. Four years later, I missed it so much that I finally went online to check pedal harp prices. I had heard about lever harp, and found out I could get a 38-string for half the price of a student-model pedal. 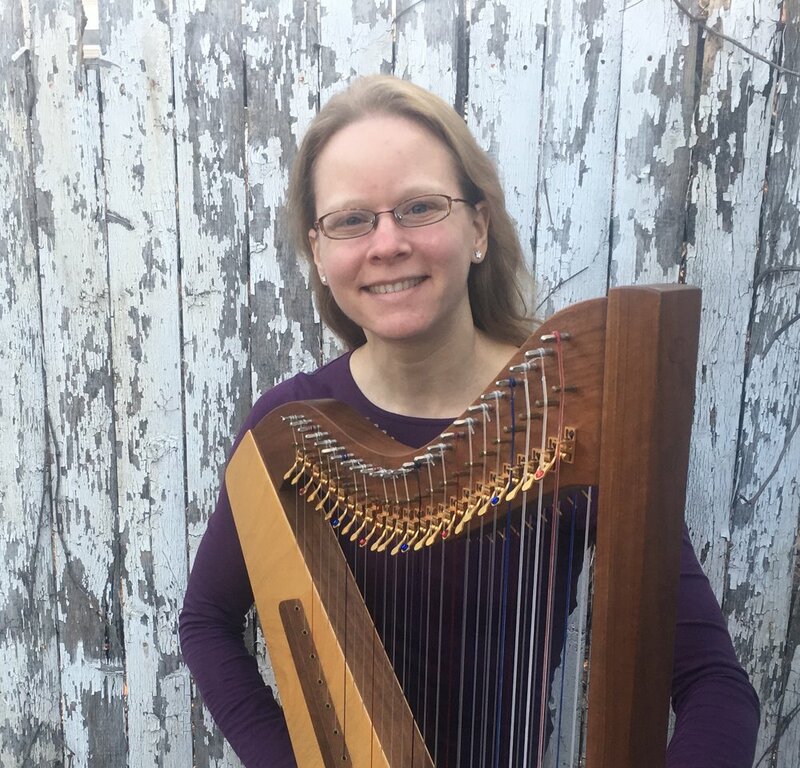 I went to the Somerset Folk Harp Festival➚ and played on all of the exhibitor’s harps until I found the most awesome one. A few months later, my Triplett Eclipse➚ arrived (the first one they made with Truitt levers), and I began delving into lever harp music. Again at Somerset➚, in 2007, I wandered into a double-strung workshop. I’d seen Don Peddle’s beautiful flat harps➚ and figured they couldn’t possibly sound as good as they looked. I had no interest in double-strung, but I was looking for something smaller to play in a therapeutic setting. I was surprised to discover the volume and richness of the 9-pound, 48-string Voyageur II➚, and I was excited by the new opportunities afforded by two rows of strings. With the big Eclipse and the compact double-strung, I didn't miss pedal harp at all. My favorite music to play and listen to includes early music, close-harmony vocals, old-time country and bluegrass, campfire songs, and melodic classics from the 40s on up. I love complex rhythms and interesting harmonies. In 2008, I began courses with the Music for Healing and Transition Program, graduating in 2012 as a Certified Music Practitioner so that I can play at the bedside of patients in hospitals, hospice, and nursing homes. I server on the Board of Directors as the President of MHTP See more on my site SoothingHarp.com➚. One of the things I noticed at the harp conferences I attended was that the adult students were disappointed by their progress with the harp. I admired all of these students who had picked up a brand new instrument later in life. I wanted them to be proud that they had gotten up off the couch and actually taken the steps to do something about their desire to make music. I hate to see people unhappy or frustrated. It is my hope that I can encourage adult students in the path they’ve chosen, either by being their teacher, or providing useful information on this website. I am a big proponent of enjoying the outdoors and spending the weekend at interesting spots nearby. If you’re looking for something interesting to do in New Jersey, especially hiking➚, I can give you some ideas. Finally, I'd be remiss if I didn't mention that I am a bodybuilding figure competitor. That means that I try to build as much muscle as I can without having my veins pop out, and then choose to be judged against other similar women on a stage. It is probably the weirdest thing that I've ever chosen to be involved in, and way more feminist than you would imagine. I am probably the only figure competitor who plays double-strung harp. Ready to contact me? You can find out more about my teaching style.